One of Nebraska’s most distinguished female artists, Alice Cleaver worked in the eastern and southwestern United States and, then during World War I when she was in her mid 40s, returned to her hometown of Falls City for the remainder of her life. There she devoted herself to painting and music and avoided most ‘bright lights’ of a wider world. Of her somewhat reclusive life, stories circulated from local people that her lifestyle was a ‘spinsterish’ reaction to a love relationship thwarted by family. Finding little tangible evidence of those assertions, one can suggest that Alice Cleaver settled in Falls City after ‘seeing the world’ because it was her sanctuary, the place where she had family, and circumstances where she could focus on her talents and people she enjoyed. Alice graduated from Falls City High School in 1888, and from 1892 to 1895, she was a student in Lincoln at the University of Nebraska, whose enrollment at that time was about 1,200 students. She paid for much of her education from scholarship money she received from the University’s School of Fine Arts, established in 1885. It is likely that Alice was influenced by the exhibitions of professional art and art education programs of The Haydon Art Club, founded by Sarah Moore in Lincoln in 1888 and closely associated with the University Art Department. During these years, art faculty members were Sarah Moore, Director, Carrie Moote Barton, and Cora Parker. Cleaver was most influenced by Parker, who had replaced Sarah Moore as head teacher in 1893. Parker’s art training included the Art Academy of Cincinnati and Académie Julian in Paris and study with William Merritt Chase at the Pennsylvania Academy of the Fine Arts. Learning from Parker, Cleaver painted with focused brushstrokes to “create a softened, painterly impression and mood.” (Kennedy 2) It also appears she learned from Parker the necessity of going to eastern art schools to be a ‘real player’ in the art world. After university, Alice lived in Falls City for several years with her parents, older sister Florence, younger sister Nellie, and maternal grandmother Mary Barker. The sisters, who outlived Alice, were active single ladies in the community, especially as Presbyterian church volunteers. The family home on East 14th Street was a large wooden frame structure with a big front porch and was fondly called ‘Cleaverville’ by the family. In 1900 at age 30, Alice again left Falls City and enrolled with scholarships at the School of The Art Institute of Chicago and four years later, in 1904, she graduated at the top of her class. She studied with Frederick Freer, Lawton Parker, and John Vanderpoel who was her most influential teacher. The last year at The Art Institute, she became friends with Vachel Lindsay, an art student who some years later became nationally famous as a vagabond poet roaming the Midwestern plains, chanting and singing his verses of praise for simplicity and love of nature. Alice’s friendship with Lindsay generated those stories in her hometown of her supposed heartbreak caused by controlling parents who hid letters from him to Alice who was then living in Falls City. However, those letters have never been found. Vachel Lindsay’s letters to his family did not indicate a romantic attachment to Alice. His writing is full of dedication to art and bedazzlement by a variety of women, especially a Miss Ruth Wheeler, whom he described as his true love. At the Pennsylvania Academy, Alice was greatly influenced by the Munich School style of her teacher William Merritt Chase. 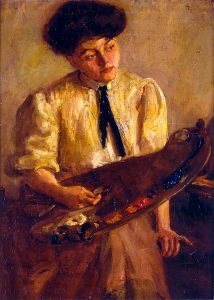 His method of heavy brush strokes on deeply shadowed and somber toned paintings is apparent in her Girl With Palette, now in the collection of the Museum of Nebraska Art. Of her painting generally, she often focused on ordinary people and scenes of everyday life such as The Ironing Girl, which she exhibited in Paris, and which eventually hung at the Falls City Library. At the Academy, she also studied with Cecilia Beaux. In 1905 and 1908, Alice Cleaver discovered the western part of the United States when she was selected as one of the sponsored artists of the Santa Fe Railway, which involved a round-trip from Chicago to New Mexico and Arizona with side trips to Indian pueblos and the Grand Canyon. The agreement was that the railroad would pay all expenses and that, in turn, the artists would create artwork that railroad personnel could use for travel sales promotion such as posters and brochures. Creating dazzling paintings of the southwest, the selected artists, including Alice, received a big boost in name recognition. When Alice took these trips, rail travel was comfortable with lavishly decorated Pullman cars and Harvey House restaurants providing meals every hundred miles. Arizona and New Mexico were exotic and sparsely populated territories with Indian pueblos, where buggies transported the artists and other train passengers through fascinating desert landscapes with cactus, snakes, and sometimes suspicious looking ‘two-leggeds.’ From these trips, Alice created seven paintings that were acquired by the Santa Fe Railway for advertising and ultimately for the corporate Santa Fe Railway Collection. Her largest and most striking paintings were showcased at the Grand Canyon’s El Tovar Hotel. She also spent time at the Isleta, New Mexico pueblo, which resulted in numerous images of pueblo life. Returning from these heady trips, Alice, in her usual pattern, went to Falls City to be with her family. Then in 1913 and 1914, she was off for more ‘far flung’ adventure ‒ this time to France to study in Paris where she became influenced by Impressionism. She maintained a studio in the back of a French courtyard and worked under the direction of figure painter Lucien J. Simon and still-life painter Louis-Francois Biloul. With a group of nine American painters, she exhibited pastel paintings in the Latin Quarter at the studio of a friend, Blanch Stanley. However her time in Paris lasted only one year because, with World War I looming, she, now age 44, returned in 1914 to the United States on the SS Rochambeau, one of the last ships departing France. From that time, she stayed close to Falls City and her family. In 1918 four years after her return from France, her father died; in 1936, her mother died, leaving Alice and her younger and older sisters, both of whom outlived her. In 1922, she exhibited in Omaha with the Omaha Society of Fine Arts. Perhaps she re-connected with Vachel Lindsay, as he was the featured speaker that year at the Society’s lecture series. To earn money, she gave music lessons locally, and also performed, as on September 8, 1930 when she had a solo violin recital at the local Presbyterian Church accompanied by Mrs. John Falter, vocalist and wife of John Falter, a Nebraska native who became a nationally famous illustrator. Alice died in her sleep at age 66, after suffering a severe attack of influenza, which led to heart problems. “Her funeral services were held at the Presbyterian Church in Falls City on Tuesday, October 17, 1944….At Miss Cleaver’s request the music at the service was performed by some of her music students.” (Schmenti 26). She was buried next to her parents at the Steele Cemetery in Falls City. Reinforcing the tragic ‘frustrated love’ scenario so often associated with Alice, art historian Jodie Kinsey wrote in the book, Independent Spirits: “Cleaver was disappointed both romantically and professionally, constrained by overly protective parents” (207) and that Vachel Lindsay trying to visit her in Falls City in 1912, was “intercepted by her disapproving father.” (247) However, Dennis Camp, biographer of Lindsay counters that story because of Lindsay’s walking itinerary. Camp wrote that “it would have been an extreme detour” because at that time he [Lindsay] was in the center of Kansas.” In the 1970s, a package of unopened correspondence from Lindsay to Cleaver reportedly was found in the attic of the family house, seemingly hidden away by family so that she would not see it. But this tangible evidence is elusive. What is known for sure is that Cleaver was a remarkable woman of her era with talent, education, and life experiences far beyond those of most of her female peers and geographically far beyond her home in Nebraska. It is fortunate for Nebraskans that she lived among us, and those who elected her to the Nebraska Hall of Fame in 1924 apparently agreed. Cleaver’s exhibitions included the School of The Art Institute of Chicago, 1899-1903; St. Louis World’s Fair, 1904, as part of the Nebraska Federation of Women’s Clubs exhibit; First Annual Nebraska Artist Exhibitions, 1922, sponsored by the Omaha Society of Fine Arts (First Prize); Nebraska Art Association in Lincoln, 1921; Midwestern Artists in Kansas City, Missouri, 1928; Omaha Art Guild, 1926 and again in 1935, which was her last known art exhibit while she was alive. Posthumously, she had work exhibited in 1946 at the Lydia Bruun Woods Memorial Library in Falls City, and a retrospective of 56 paintings in 1970 at that library by the Falls City Art Association and the Friends of the Library. In 1986, her artwork was part of the Museum of Nebraska Art opening exhibition in Kearney, Nebraska. In 2003, artwork by Alice was featured as a selection of the Museum of Nebraska Art’s exhibition titled Women Artists from The MONA Collection. Paintings by Alice Cleaver are in the Santa Fe Railway Collection; John H. Vanderpoel Art Association; Museum of Nebraska Art; and in Falls City at the Richardson County Nebraska Historical Society Museum and the Lydia Bruun Woods Memorial Library. The Museum of Nebraska Art has six works by Alice Cleaver.